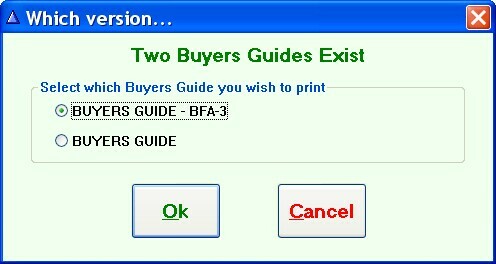 The Buyer's Guide is available for printing from the individual vehicle screen or from the Forms Printing list. In the Forms Printing list, the Form Number of the Buyer's Guide is 54. 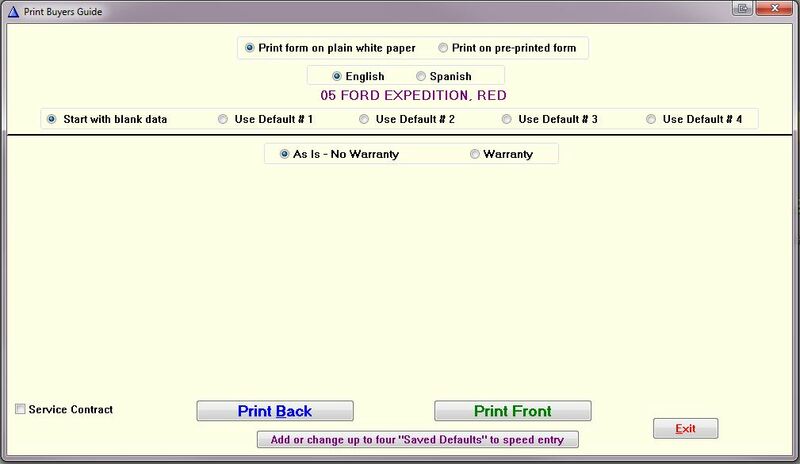 To print from an individual vehicle, click on . Highlight the desired vehicle and either double left-click the vehicle or click on . Click on in the upper right of the screen. Select from Start with Blank Data, or choose one of 4 possible Default options. The Default options are set up when selecting "Add or Change up to two "Saved Defaults" to speed entry." If a pre-printed buyer's guide has been specifically requested for programming, you will be prompted to select which guide you want to print when the pre-printed form option selected (this only appears when printing the Buyer's Guide from the vehicle screen).